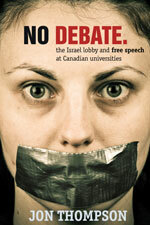 During 2008–2009, pro-Israeli lobby organizations and individuals made concerted efforts to block a planned conference at Toronto’s York University on models of statehood and paths to peace in Israel and Palestine. This book is a report of an investigation by one of Canada’s leading experts on academic freedom, Prof. Jon Thompson, for the Canadian Association of University Teachers, an organization that has been active in the defence of free speech and academic freedom. Controversy began at York soon after the conference was advertised, and it intensified over the following months. The event was repeatedly denounced, and university administrators were actively pressured those opposed to holding the conference. York, as the host university, was warned of boycotts and the cessation of donations and was denounced in full page newspaper ads. When York and its co-sponsor, Queen’s University, stood their ground, the Harper government contacted the Social Sciences and Humanities Research Council (SSHRC), an academic funding agency that was helping fund the event. In response to the federal government pressure, SSHRC made an unprecedented intervention with the conference organizers. The Canadian Association of University Teachers made a public issue of the government's interference and of the various attempts to block the conference. In the end, the conference was held as planned. This book establishes the facts of the case, provides a context for understanding it, reveals the threats to freedom of expression, explores the meaning of academic freedom in Canada and makes a series of recommendations to advance academic freedom. Toronto: James Lorimer & Co.